> Heavy Duty Single Layer Dual Adjustable Tactical Cobra Buckle EDC Gun Belt 1.5"
Heavy Duty 1.5" Single Layer Dual Adjustable Tactical Cobra Buckle EDC Belt. Webbing is made in the USA. The AustriAlpin COBRA buckle is made in Austria. Belt is assembled in the USA by Hank's Surplus and made to order. Rigid vertically and flexible horizontally. 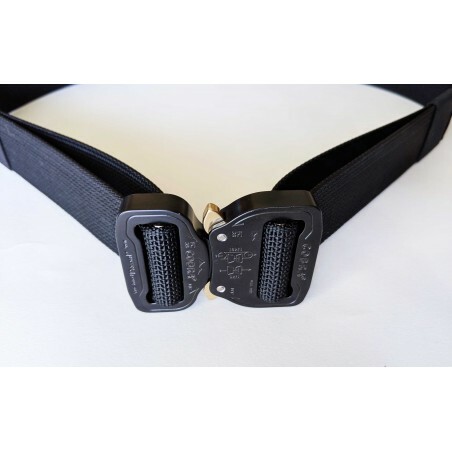 Elastic strap keeper is black color. The COBRA buckle is black color. We do not have any other buckle colors at this time. Please allow 2-3 business days for us to make the belt. Sizing is based off USA Men's pants size. Belt is adjustable. In general we recommend ordering the same size as your pants size. For example if you are a 36" pants size then order a Large belt. If you are unsure about your sizing please order one size up and then if needed adjust downward with the extra webbing. Any questions regarding size please contact us before ordering.